Indonesia's central bank on Wednesday lifted rates for the second time in less than two weeks as policymakers moved aggressively to fend off the threat of further capital flight. Bank Indonesia (BI) lifted its key policy rate by a quarter of a percentage point to 4.75 per cent in an out-of-cycle meeting that followed a similar move on May 17, as new central bank governor Perry Warjiyo moved quickly to deliver on a pledge to stabilise the rupiah. Rapidly climbing US interest rates and a surging US dollar led foreign investors to pull billions of dollars from the country's capital markets in recent months, sendin g the currency sharply lower and igniting fears that the turmoil that has engulfed other emerging markets such as Turkey and Argentina could spread to our region. More recently the pressure on emerging market currencies has eased as US rates have retreated. Nonetheless, Indonesian policymakers were focused on "getting ahead of the curve ahead of the US Federal Reserve meeting in June," ANZ head of Asia research Khoon Goh said. Capital flight in recent weeks has hit Indonesia's currency. "The move is designed to stabilise the rupiah, and Bank Indonesia will continue with intervention to support the currency," Mr Goh said. He now expects another rate rise at the next scheduled meeting in June. Wednesday's decision was widely anticipated and comes as emerging markets financial asset prices have recovered from the worst of their recent falls. The rupiah drifted higher into the announcement and was largely unmoved following the news to trade at 13,990 per US dollar. The US Federal Reserve expected to lift rates again in June, and analysts and investors have lauded Mr Warjiyo's decisive moves to get ahead of the curve. "While higher interest rates will have an impact on growth, policymakers are willing to accept slower growth as a trade-off for stability," Mr Goh said. 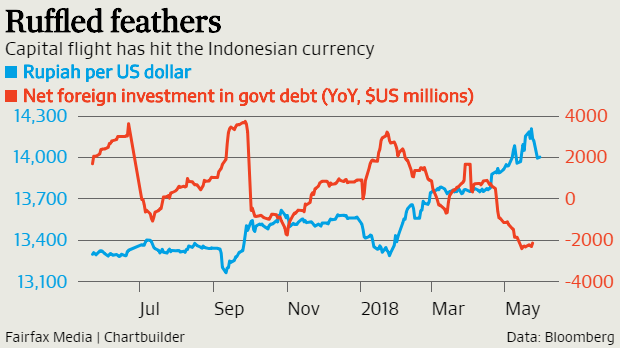 "Given the large foreign investor outflows seen since February, Bank Indonesia's efforts to stabilise the rupiah could entice a return of inflows." The May 17 rate hike and further commitments from the central bank to ensure the stability of the currency â" which is Bank Indonesia's primary mandate â" have already contributed to the recovery in the rupiah and supported the bond and equity markets. The currency has recovered 1.3 per cent since Mr Warjiyo was appointed governor on May 24, but the rupiah remains 5 per cent below its late January peak. Ten-year bond yields had climbed as much as 1.4 percentage points since the end of January to touch a 15-month high of 7.6 per cent last week, but have since retreated to yield 7.2 per cent. After plunging by close to 15 per cent between its January peak and its May 21 low, Indonesia's benchmark Jakarta composite equity index has rebounded 6 per cent. It has still shed a tenth of its value this year. With about 40 per cent of Indonesian bonds in the hands of foreigners and the economy running a current account deficit, the country is the most exposed among south-east Asian economies to capital flight as a result of sharp reversals in sentiment â" particularly those triggered by moves higher in US dollar rates. Experts have been quick to point out that while Indonesia runs a current account deficit equivalent to 2 per cent of GDP â" in a region mostly in external surplus â" it is much improved from deficits of 3.5 per cent of GDP five years ago, when the so-called "taper tantrum" roiled emerging markets. Over the same time frame, core inflation has dropped to 2.5 per cent from about 4.5 per cent. "We think fund amentals are robust and that a crisis is the best time to build exposure to this structural growth story," SG equity strategists said.